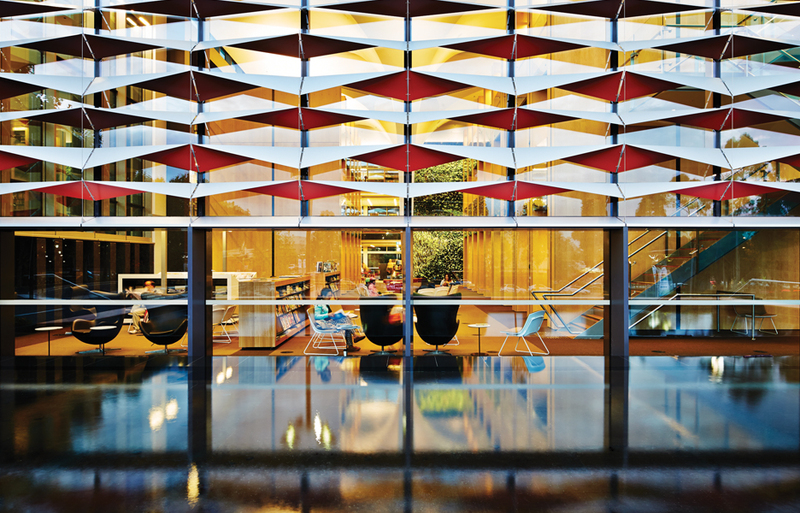 Opening in April 2014, the Bankstown Library and Knowledge Centre is a gracious and considered design from Francis-Jones Morehen Thorp (FJMT), offering much for the local community. Categorised by the architects as a hybrid between adaptive reuse, something completely new and an alteration/addition project; as a result of its unique modifi cations to the existing town hall building, the new centre provides a seamless transition. Primarily, the new incision is the library, whose entrance is compositionally adjacent to the existing town hall building, but is somewhat awkwardly placed. The town hall building, built in the 1970s, was a simple, rectilinearly planned building, accommodating a main auditorium space. FJMT’s proposal inserted the three-storey library within the old auditorium location, with the upgrade also including a 300-seat theatre, community conference facilities, new cafe and an interactive community information wall at the foyer and entrance. 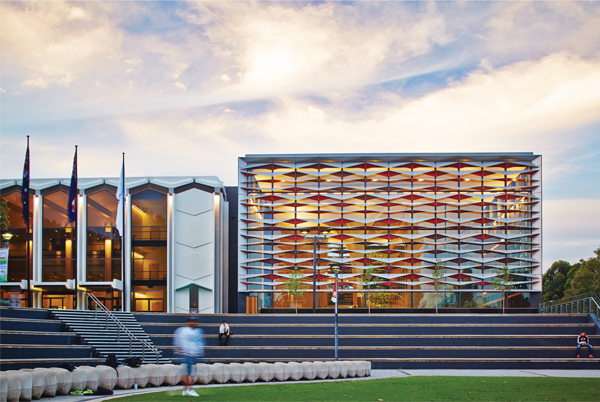 FJMT won the project through an initial competition process, with the Bankstown City Council enthusiastic about the architects’ delivery of this building, citing FJMT’s previously completed Surry Hills Library as a reference point or benchmark throughout. FJMT had been sourced to create a successful community project, building on the success of their last. The new library is simple in form, aligning to the existing town hall in height and is similarly cubic. 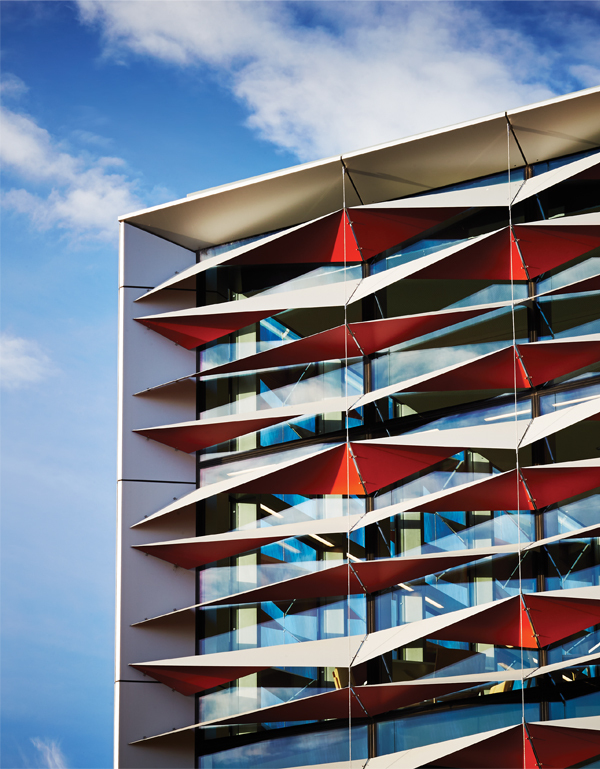 The external geometry presents as a perfect square, with a colourful and beautifully detailed, sunshading louvre facade system set within the box-like form. The louvres twist and fold, playing off the existing chevron patterns on the existing town hall building’s elevation. 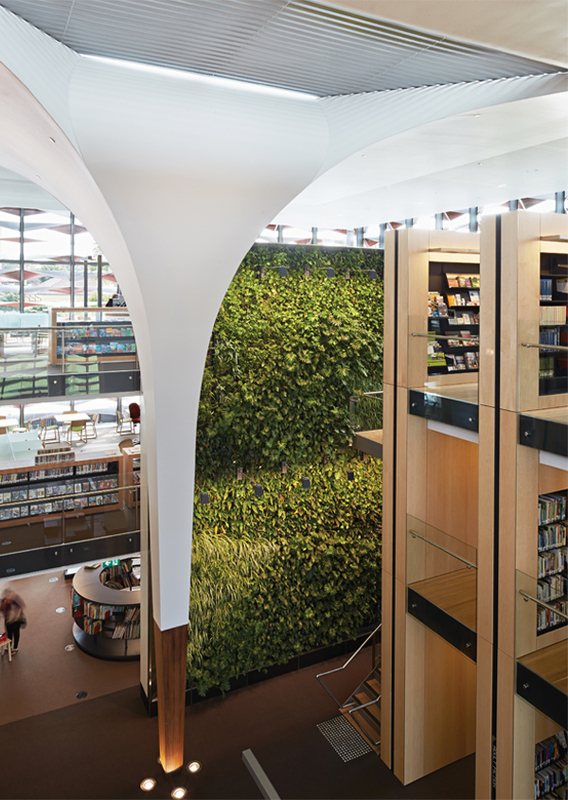 In section, the main internal feature of the library is revealed – two large, bulbous columns, reminiscent of two soaring trees, creating a place for the local community to gather. The columns are located at the building’s central atrium, with bookshelves stacked up three storeys on either side; the columns can be viewed from each level. The shelving offer Juliette-style balcony arrangements, which look into the main atrium space and allow for efficient visual and circulatory navigation. 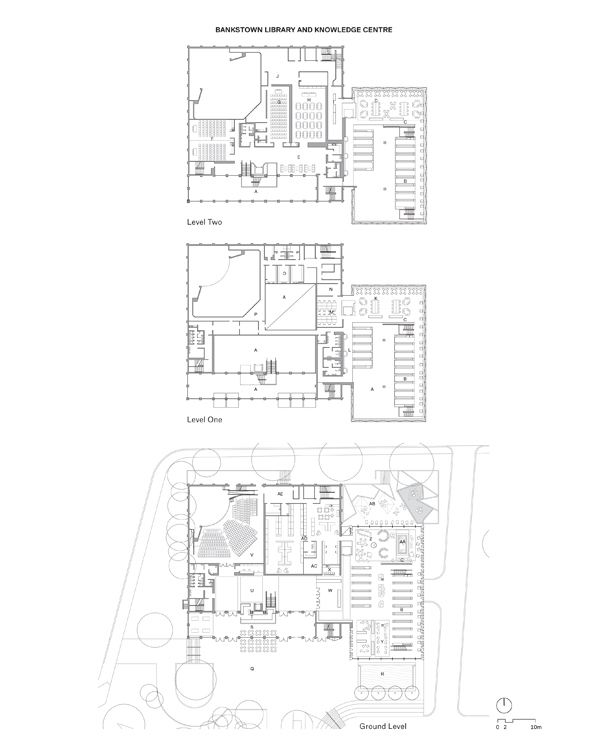 While the plan is rather strict in arrangement for a contemporary library, it contains flexible open-plan spaces in the atrium and a children’s room that allows for additional uses for casual events. The main circulation stair seems hidden from view in the atrium, but is actually hidden in plain sight as it is easily identifi ed and located by the green wall spanning alongside the stair. The green wall acts as a fi lter for the air-conditioning, with its optimum oxygen level in the morning, it filters the return air in the day before undergoing a night purge, while the plants are going through the process of photosynthesis. Other innovative ESD strategies in the scheme include a thermal labyrinth, photovoltaics and geothermal bore, creating an environmentally friendly building with key health and energy benefits. Interestingly, the old town hall not only provided FJMT a compositional adjacency, but also a material bank. Important to the realisation of the building was the innovative reuse of the ‘found’ materials in the existing building, which were implemented into the new building. Large portions of the existing auditorium were deconstructed and reused in the new building, due to budgetary constraints, intentional concept strategies and environmental initiatives. Most notably, the auditorium stage was salvaged to create new stair treads that were milled and biscuit-jointed on-site. While the existing auditorium floor – made from tallowwood – was re-laid as the new library flooring between the bookshelves; the black Tasmanian oak feature trims (in the existing auditorium) became vertical design characteristics for the new bookshelves, where the black stripes help define the three-storey book storage; and, even some of the existing concrete and steel was used in the new pile structures. As the saying that goes ‘they don’t build them like they used to’, it is something of an important idiom in this building, given that the existing high quality materials in the town hall have allowed for a present day reuse. It is a prescient point to consider, in the making of public buildings today, could the same hybrid reuse and renew procedure be reinterpreted in another fifty years with the building design process today? Given the profession’s intensifying budgetary constraints on a project, can it be reused again after it has already been significantly stripped back is something of a tall order. Moreover, can the salvage and reuse apply not only to material palettes, but also spatial conditions? An intriguing example comes in the form of one of the ESD initiatives at the Bankstown Library: the thermal labyrinth, where air could circulate through concrete masonry blocks to aid air-conditioning and ventilation processes. This labyrinth existed in the old orchestra pit, two storeys under the new library podium, with no additional construction required, except for the addition of the concrete masonry blocks. 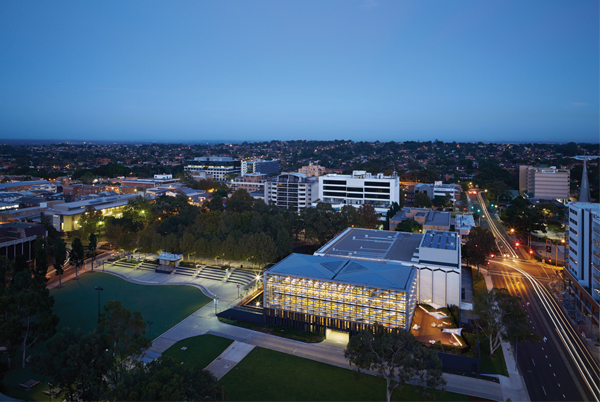 The library is situated in the Bankstown city urban precinct in the foreground of Paul Keating Park – a park where the former council chambers once stood, which was unfortunately destroyed in a fire in 1997. The new library is well situated within its urban context – with modest site lines, built form and scale, creating a simple and thoughtful addition to the park. However the building does also standout as a highly detailed and architecturally designed building – something quite rare in the Bankstown urban context. While the council have benchmarked FJMT’s project for the type of quality building and civic strategy they envisage for their local community, they also now have the project to benchmark for their own future developments. 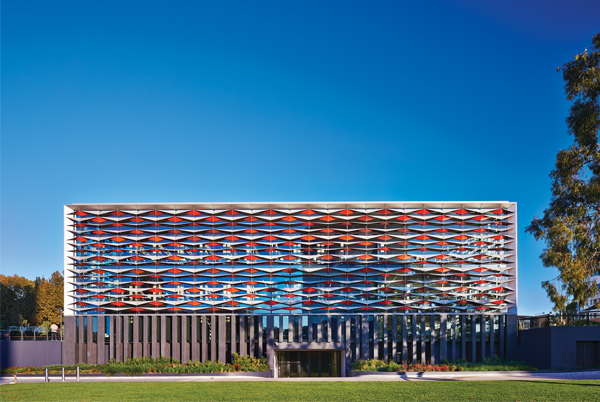 The building, therefore, has experienced a fi ssure between a modest urban inclusion to a civic park and a clear architectural expression, which contrasts with its urban environment. It is encouraging to see the progression of Bankstown City Council with this architectural vision, raising the bar signifi cantly higher in order to maximise the possibilities for the area.